A baboon’s heart, hockey, and one hell of a sweet story. That’s what you STILL get with Untamed Heart, now making its blu-ray debut. Caroline (Marisa Tomei) has too good of a heart. So say her friends. And, judging by how happy she is to see her boyfriend, who promptly dumps her at the film’s beginning, it is hard NOT to fall in love with this woman. Tomei is seen, as soon as we get the tragic backstory of Adam (Christian Slater) out of the way, rushing from her work down the block, into her house, stripping as she goes, in order to get dressed for her date . . . only to be crushed as soon as she gets in his truck. Poor girl. "Sappy and sassy and full of real emotion, Untamed Heart is a modern love story that is as honest as the day is long"
It is ironic then that Adam, a shy man with a bad heart, also works at the diner she waitresses alongside Cindy (Rosie Perez). We already know that in this romantic drama, the two will cross paths, but in this working-class narrative, we just don’t know how it will all play out. For the life of me, there are few cinematic romances that have touched me as much as the one that is at the center of Untamed Heart. It is a perfect vehicle for Tomei and Slater’s talents and, together, the two will have you tumbling endlessly into love. Even if it doesn’t work out the way we want it to. That tragic beginning? Well, the past is prologue and, like any good screenplay, we already know how this one is going to end. But it’s not the destination, right? And the journey of Caroline and Adam is well worth the purchase of this underrated film from 1993. Sure, the film is syrupy. It is also heartfelt. And that makes it a keeper in my book. The fact the Kino Studio Classics has issued it on a blu-ray should have your fists pumping as hard as they do when Adam comes to Caroline’s rescue the night she is knocked unconscious and almost raped by two stalkers who also frequent her restaurant. 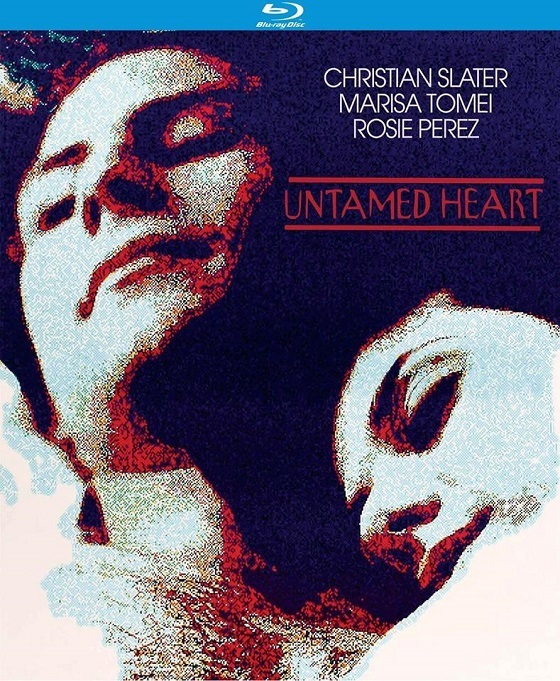 Directed by Tony Bill and written by Tom Sierchio, Untamed Heart is, yes, one part of the three-year Slater renaissance that occurred when the actor was hitting high notes with Kuffs, True Romance, Pump Up the Volume, and Robin Hood: Prince of Thieves. Is it a classic drama? Oh, probably not. But it is one of the few working class charmers that we have. Who could forget the scene where, in the days following her attack, Adam reaches for her going down on the escalator while she is going up? No one. 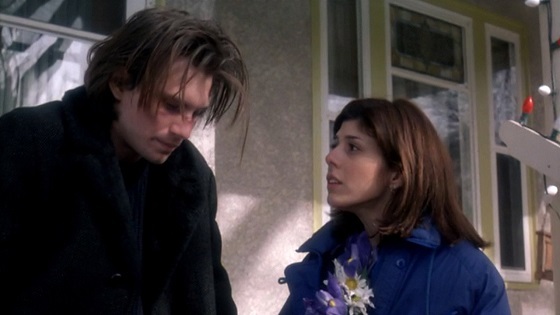 Sappy and sassy and full of real emotion, Untamed Heart is a modern love story that is as honest as the day is long. 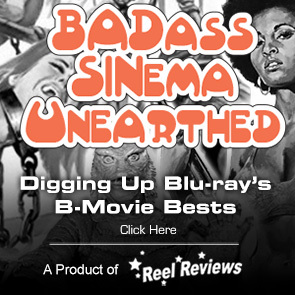 It is also STILL a damn good romance with solid performances from Slater, Tomei, and Perez. It is now available on blu-ray thanks to Kino Studio Classics. MPAA Rating: PG-13 for some strong language and violence, and for sensuality. Tagline: He doesn't make sense. She doesn't make sense. Together they make sense. Memorable Movie Quote: "I wonder if you think about me half as much as I think about you"
Synopsis: Tomei portrays Caroline, a diner waitress who is consistently and miserably unlucky at love. Slater is Adam, the diner’s busboy who harbors a secret crush on Caroline, yet is too shy to speak to her. But all that changes one cold night, when Caroline finds herself in a life-threatening situation on her walk home and Adam appears out of the shadows to rescue her. Intrigued by her unlikely knight in shining armor, Caroline tenderly breaks through to his lonely world. Together, the two forge a bond of trust and understanding that ultimately blossoms into one of cinema’s most unforgettable love stories. Presented in a crisp 1080p transfer, Untamed Heart and its new scan of the original negative is a thing of pristine beauty. The film is dominated with reds and greens that absolutely burst with color. The uniforms are detailed and the simple backgrounds burst with new details and a nice level of clarity. Black levels are solid and skin tones are natural. Shadows are defined and the film has a new depth previously unseen. Audio wise, the DTS-HD MA 5.1 soundtrack is clear and the dialogue is never lost or hard to hear. There is a new audio commentary from Director Tony Bill. It is moderated by filmmaker Douglas Hosdale.